Hey, everyone. This is Chris from StrategyBeam, and today we’re going to continue our quest to look at various apartment websites to point out some opportunities for improvement as well as what we like, what we don’t want and everything in between. Right now, we’re going to take a look at NorthBridge at Millenia Lake. This is a higher end apartment complex and townhouse for rental properties here in Orlando which is where my wife and I live. So let’s go ahead and dive in and take a look. Starting on the top left, we see that there’s a phone number; it doesn’t stand out. I’d recommend making that a little bit bigger and also changing up the color of that content. You want the phone number and the ‘Apply Now’ to be the most visible because that is the ultimate goal of your website as you get people either click in, schedule a tour or to call and have that one-on-one communication. The next thing that I noticed is these social icons up here. I think that those would be best to be moved because you don’t want people clicking off of your website to go check those out right now; that’s a little bit later in the process. You want to minimize any links near the top of a page or the most valuable parts of your page unless that fulfills your business goals. Going down, this is the first website that we’ve seen so far that has left-hand navigation. I go both ways on this. I’m more traditional, so I like to have the navigation at the top because I think that’s where most people are used to it. It also tends to look best on mobile, but it’s not a terrible idea here, so we’ll kind of breeze past that. One thing that stands out to me is this scrolling background carousel. Just as a general rule of thumb, you never want to have changing images that are in the text. This is because the writing is going to be static. The ‘500 dollar Off Rent Today’ is the main call-to-action or the central message that this apartment wants to portray and promote. However, this changing background draws the eye to some things. You have a couch and a lamp at the bottom right. Then with the next one, you suddenly have a table and doors and stuff. So, the lines of symmetry, the drawing your eyes all around, are a little bit wonky at best. As we continue to go down, it goes all of a sudden into a three column design. You could see one, two, three. Not a big fan of that because I think it squishes the more important stuff. So, on the left-hand side again, there’s ‘Select Date’ which is pretty cool. This is scrolling, and also these are not clickable. You want to minimize any movement on your site; especially when you’re using a three column design because everything is already squished. But I do like that they have ‘Learn More’ and at the bottom left of the screen you can see that’s going to go to the ‘Amenities’ page and we’ll take a look at that a little bit. One significant option for improvement here is, if you ever wanted to keep this column and take this away, I’d recommend making this a two-thirds column layout. So, combining this part here with this section here. And this will allow you to build out your content. I would also swap it with this. So, this column over here and then two-thirds here. And the reason why I recommend that is because this is one big block of text. It looks pretty bad on my desktop, and I have a large screen, and it’s going to watch even worse on mobile. Also, you want to keep every paragraph about two to three sentences. Right now this one looks to be about ten; something like that. What that’s going to do is allow you to break out the text so that it’s going to pronounce the more important things and also optimize this content. I would go ahead and bold this right here. I would use these H2 tags as a little bit more opportunity and also you could build it out. If you had a two-thirds, you’d have twice as much room so you can include pictures and also interlinking is pretty big here. ‘Convenient Services’ is something that I would maybe link that to another page so that it helps people moving through your site but especially here like here you would have a paragraph break and then ‘Array of Amenities’ would be a great link to have to your amenities page. There’s also seems to be quite a bit of wasted space on this page. I mean right here, this is all cosmetic. If you look at this like that’s that’s a significant portion of your screen which is just for a lifestyle kind of atmospheric shot. We want to always include CTA’s throughout the pages. That’s one thing that we’re going to notice a lot with this site is that, just going down, there’s nowhere to click to find additional information about applying, about opportunities, about who to call. So, the best way to do that is to make this band; this is called a band right here, it’s a row. And make that a solid color, with a white button, or you could have the same image but put a higher, you know, black or grey on top of it. This will ensure the CTA stands out a little bit less, then have a button that just goes to your ‘Apply Now,’ and that’s, you know, with some text that says, “Hey, you know, now it’s time to move forward or something like that. I love that they have a blog but the one thing that worries me is that it doesn’t show what’s important. And also, you know, there’s like one here. 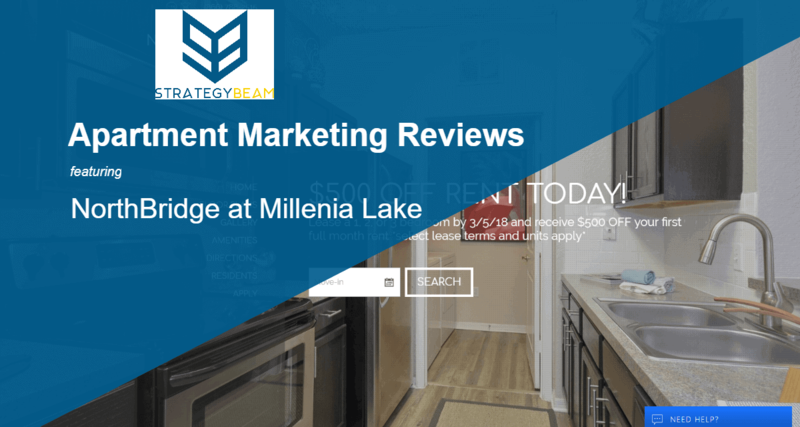 So, you should have a blog section on your apartments because you want to start bringing in qualified leads by understanding the needs of your target audience. If you’re near a college campus, you start talking about study habits, how to save money, first-time roommates, how to be a great roommate; stuff like that. And if that’s what people are searching for, just through keyword research, you could drive them to your site and then it’s likely that if you’re targeting the right people that those people need to have an apartment from you. That’s also a great place to kind of build email list, as well as engagement; stuff like that and get a better online presence with social media which just continues to drive traffic. What I’d recommend here is talking about what the benefits are and then also maybe have like three or four of the most recent blog post but with images and then like a short title, maybe a little excerpt or something. But right here, ‘Advice for Daily Walks’; it’s a wasted space, so I’d recommend improving that. And here you have a very, very large row which is just dead space right now. This is where people are most likely going to go, and you should look at this in your analytics to figure out what pages if you need to prioritize, money and resources; what pages you should work on first. But the floor plans, gallery, and amenities tend to be the highest traffic. When someone goes to your amenities page, they want to learn about the lifestyle and about the benefits and the convenience that your property offers them. Going down the site here, we never have a full image in the background. It’s very disorienting; it’s very jarring; especially as you’re like scrolling down, you almost get motion sickness in a sense. The biggest thing here is your amenities always have to show value like saving time or saving money. So, if you have a pool at your apartment, you’re going to be saving money because now you don’t have to drive to a pool, drive to the beaches, you don’t have to get the kids in the car, figure out when you could go with your spouse or significant other. And that’s something that just isn’t here right now. So, is an amenity like ‘Move in Made Easy with our Digital Consignor.’ That doesn’t mean anything to me. 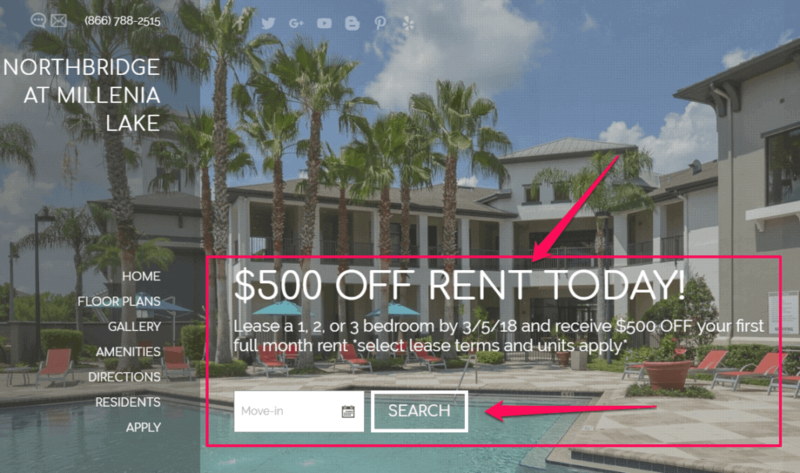 What Is The Purpose Of An Apartment Marketing Website? The purpose of your website is supposed to be getting new users or new audience to convert; you need be showing them exactly what you can get them. Car care center; awesome. We accept packages; that’s great. Private walk path to Millennium Mall; that’s cool too. And two resort-inspired pools; that’s a great copy. But to see it, you need to click on it. And also there’s no CTA’s here. What I recommend is instead of just having a bullet list; like you’re going to the grocery store, actually make this an experience. Because this is a pretty high end, an expensive rental property that I know firsthand and it does not promote that as much as possible. I would take out the sidebar. You don’t need to have all this stuff here because it just limits your ability to grow. 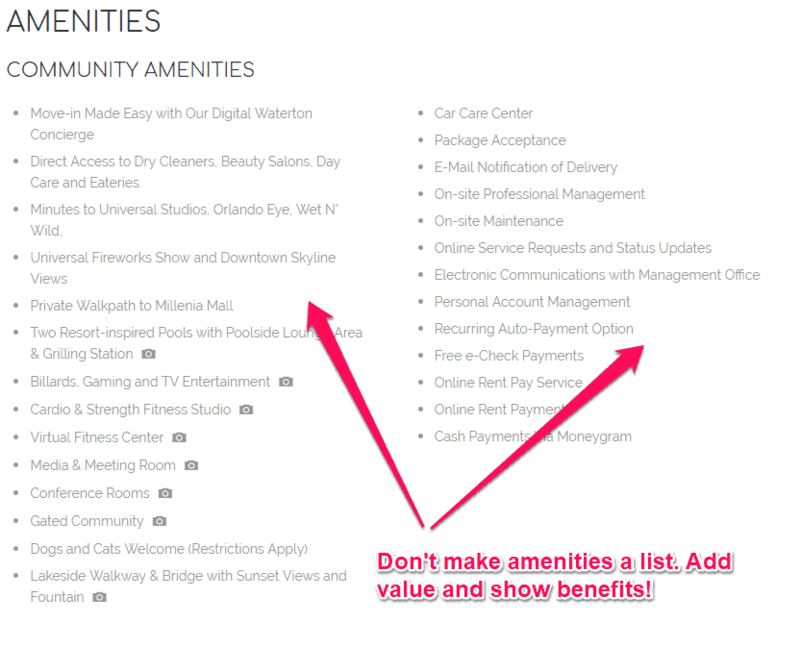 And it should be broken out within every two tags like each one is ‘Amenities’ or ‘NorthBridge at Millenia Lake amenities’ and then underneath that is ‘Outdoor Amenities,’ ‘Convenient Amenities’ and then something else or whatever. You could categorize your offerings by things like indoor amenities or whatever it is. And with pictures and also those CTA bands that we were talking about where you have that button, so people could go ahead and apply or call you. And as you just keep going down ‘Apartment Amenities’; that’s pretty cool that it’s broken out like that. But you need to click on this, and that’s pretty difficult on mobile. Instead of that, they could do a lot better job with building this out. And at the bottom of every page, you always want to have a call-to-action so that people can go ahead and take action to move on. Let’s look like at the gallery page; I don’t think that people need to click through this because that’s difficult on mobile and I bet you that about 55 to 60 percent of traffic comes through here on Mobile. This is especially if you’re out searching for apartments, you need to be looking at mobile. 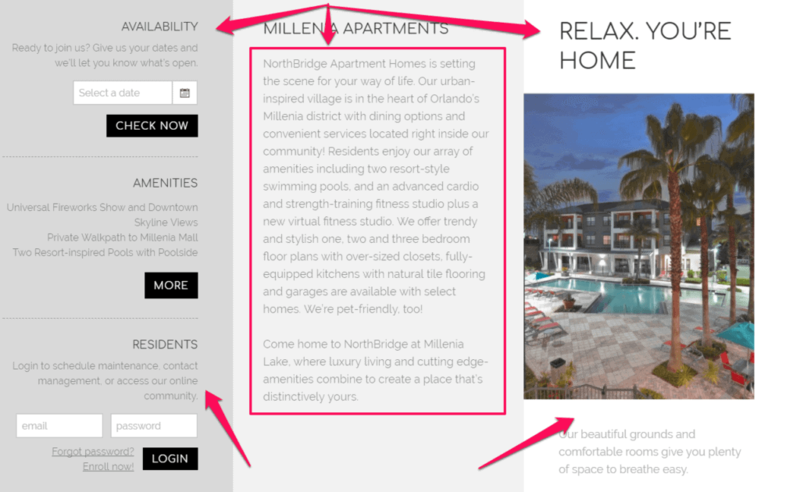 There should be keywords like ‘Best apartments near Millenia Mall,’ ‘NorthBridge at Millenia Lake,’ ‘Rental apartments, Central Florida’; whatever it might be. Optimizing content to get Indexed by Google that across every page and then having a set of keywords per page based on the needs of your audience and the goals of the business. Right here this is just not enough. And, you know, the apartments near Millenia Mall might need to be more of a location base. This one needs to be talking about the pools, the experience, the luxury; things of that nature. So, I hope that makes sense. And this was the first website that I found that had a video. So, if we click on it, I’m going to turn down the volume quick because I don’t want to hurt your ears. So, we’ll just get this quick. I’ll cut kind of through it. Pretty impressive, like dance music I guess. But one thing that I saw here and let me just see if I can. Going only through here is that they have like all these great videos with these still images and a bowling alley- I didn’t see that bowling alley anywhere. So, they need to improve on that with the overall experience and description and have a lot better click through. 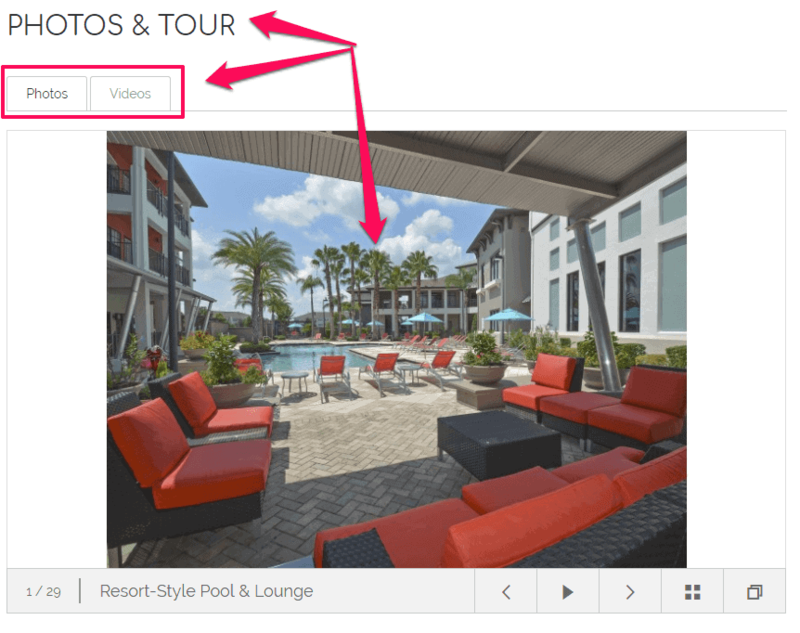 So, from the amenities, it should go to your photo gallery, which should go to your floor plans, which should go to your ‘Apply now,’ and you have control over that; which is just not being taken advantage of here. Then finally, let’s look at the floor plans. Sorry for having it cut out there; awesome video. As we go down, this is too squished; they need to be thinking with breaking it out a little bit more. The apartment complex needs to invest to have these built out more, and these should be 3D models. You should always have 3D models on your apartment website; that’s just the way you need to go because a 2D looks very cheap and it’s not great packaging. I like this here; ‘Only one left’; great sense of urgency. But just going down, you know, we just seem like down here we have like an <h2> tag. But again, there’s no phone number. We don’t need this right-hand sidebar. You don’t need to have a pet policy on every single page. You could have it on specific pages for example. Improve Your Apartment Website Today! So, there you have it guys. We just looked over the NorthBridge at Millenia Lake. Look some things such as the design aspects, the amenities, with call-to-actions being more descriptive, formatting content and then also utilizing a little bit more advanced design tactics to break up the content, make it easier consume; not only on the desktop but mobile. So, if you like the video, please give a like, comment and subscribe. Also, share it with your friends because that helps us out a lot. And we look forward to working with you on the next apartment website breakdown; just looking at different ways that we can apply some basic website design and copywriter and content marketing and SEO marketing to apartment websites that you can use for your business or any other industry. So, thanks to a lot of guys and we will talk to you soon. Bye.